When a storm rolls into town and winds batter down against your home, your roof can take quite the beating. And when all is said and done, you could be in need of emergency roof repairs to handle all the damage those heavy winds and rain caused. But how exactly do you handle emergency roof repairs? What is Considered an Emergency Roof Repair? Generally, an emergency roof repair is one that is required to fix damage that allows water infiltration. These repairs usually fix missing shingles, holes, or other structural damage that allow leaks into your attic. Many times, this damage is made by natural causes, such as storms via winds, lighting. If the damage is not made by nature itself, heavy winds can knock over trees that can fall onto your roof and pierce it, if not damage it further. Other times, water damage can allow critters to get into your roof and wreak havoc on your home. 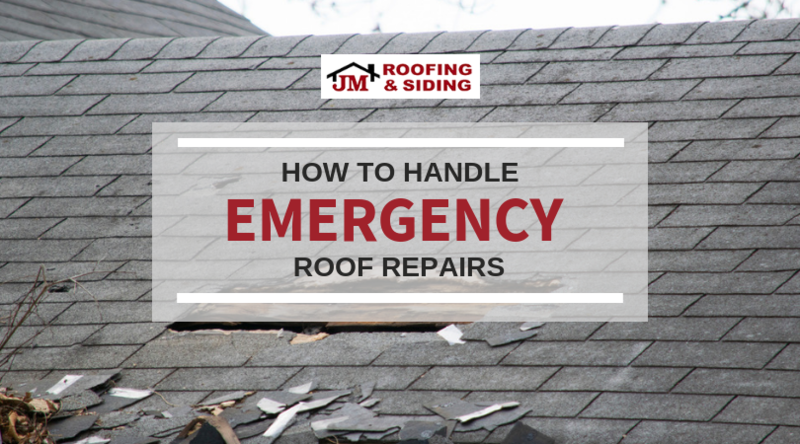 What Steps Do I Take for Emergency Roof Repairs? If you notice the damage during the storm and call your trusted roofer for repairs, they will likely tell you to hold off until the morning — the damage is done, and there’s no fixing anything while the storm is still going. During a storm, you’re best off calling your insurance adjuster so they can assess the cost of the damage. Then, once your roofing contractor arrives after the storm, discuss your repair options with them so you can determine the most affordable and best option for your roof repair. If you are in need of emergency roof repairs, contact JM Roofing & Siding. We will help you with a wide variety of residential roofing services, including new roof installation, roof replacement, roof repair, and general roofing services.